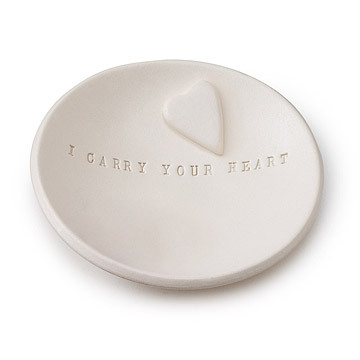 A tender bowl to have and to hold onto your most precious jewelry, this elegantly-etched dish is handmade by artist Caroline Colom Vasquez with the beautiful words, "I Carry Your Heart." Encapsulates all the sentiment of a wedding band or special piece in a pure treasure of a gift. Made of fine, white ceramic with a semi-matte finish, the shallow dish holds a free-standing heart token as a symbol of lasting affection. It's sized to hold a wedding ring or other special keepsake, but more importantly, it'll remind the recipient of your commitment to "carry" each other throughout life. Handmade in Texas. Please note the heart token is loose and not attached to the bowl. Caroline Colom Vasquez is an artist and designer living in the vibrant city of Austin, Texas. Her studio is dedicated to creating handcrafted modern heirlooms--pieces for the home and for the heart. Caroline's collection of bowls, tiles, ornaments and decorative pieces are intended to last for generations, and are thus crafted of the finest natural materials available, including porcelain and clay, wood, paper and cloth. The inspiration lies in the purity of the materials used, and the idea that something so simple can be so bold. Caroline strives to create items of meaning and purpose from these materials, while leaving the characteristics true. By adding text to the designs, written ideas, feelings and daydreams are given a place to rest. When names and dates are added, the designs take on special meaning for the recipient and instantly become a Modern Heirloom, cherished for years to come. She is most known for the conception of the Ring Bearer Bowl, a design Caroline debuted to much international acclaim in 2007. This tiny ceramic dish is intended to replace the ring pillow in a wedding celebration, and is creating a new tradition in ceremonies around the world. The Ring Bearer Bowl, which also doubles as a holiday decoration or ring dish in the home, has created a new and lasting standard in the modern wedding ceremony, and a new form of a family heirloom. All of Caroline's pieces are hand cut, freeform, with no pattern, and every single tiny letter is hand stamped, one by one. This gives each piece its own special variation in the size, shape and layout of the text. Recycled, up-cycled and biodegradable products are a huge part of Caroline's work. Her studio is powered 100% by renewable wind energy, minimizing the footprint left behind by the production of these beautiful heirloom pieces. Due to size, please keep heart token away from children under the age of 3. Bowl is 3.5" in diameter; heart token measures approximately 1" long. Not for use with food. Hand wash and air dry. My husband and I had our wedding bands engraved with lines from the [i carry your heart] poem, so when I saw this ring bowl a few weeks before our wedding, I knew it would be an exquisite detail to add to our beautiful wedding day. On the day, we used it to hold our wedding rings during the ceremony. Now that we're married, it sits on my vanity table, a lovely reminder of that day. I learned close the big day that I'd be reading ee cummings' poem "i carry your heart" at my sister's wedding. I had ordered a custom Paloma's Nest bowl for my own wedding but there wasn't time to do that. However, this bowl fit the bill perfectly. Uncommon Goods provided a quick shipping option and it was delivered 2 days ahead of the wedding. My sister, in the flurry of activity, forgot to open it until her wedding morning but that was good timing anyway. She loved it and now their rings can sit beside each other whenever they remove them. It's a good product- delicate but not really fragile (that is to say, don't drop it, but bumping it or moving it around isn't going to damage it). The bowl was the exact size as listed on the website and is so pretty. I love it because I've always loved this poem and it will be read at my wedding in August, so this was perfect for my wedding and will help add a unique element to make it our own. My ring bearer is 4 years old so he'll be able to carry it down the aisle. The best part is after my wedding I'll use it on my vanity to hold my rings and it will remain a special keepsake! The gift was well received by the recipient. She loved it. This is a beautiful (and unique) replacement for the ring bearer's pillow. While I do not like the separate heart that comes with it - as I like the simplicity of the line from the ee cummings' poem on the plate - it is precious and crafted quite nicely. I would also call it a plate not a bowl. The best part of this item is when the wedding is over, you can put the small plate on your dresser to hold your rings. On one final note, for those complaining about the size, dimensions are listed. Very meaningful gift in my case. Her exact words were "this is the best gift that i have ever received". That is saying a lot considering all of the jewelry she has been given. I gave this to my newly-engaged daughter where she could put her ring when she was doing dishes, bathing, or other chores around the house. She was THRILLED with it, especially it's uniqueness. I read this poem at my wedding 33 years ago and just love this bowl. It sits on my dresser and serves as a reminder of a wonderful day! A tender bowl to have and hold on to your special jewelry, this cermaic dish by artist Carolina Colom Vasquez is a keepsake for life.